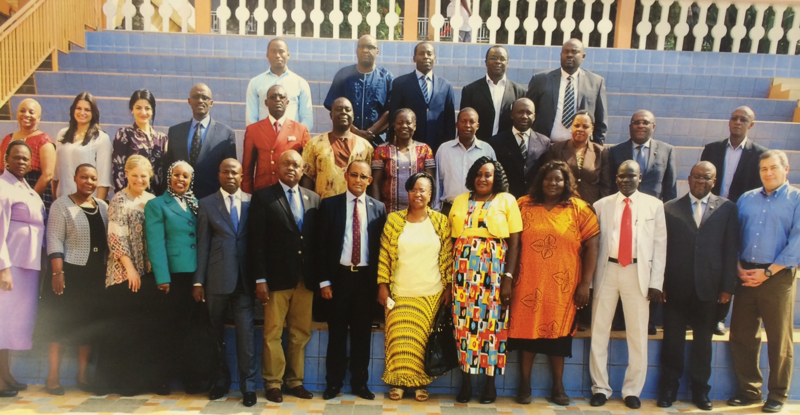 KAMPALA, UGANDA – From January 7 – 9, 2015, AIPR co-organized a convening for International Conference on the Great Lakes Region (ICGLR) regional and national committees devoted to genocide and atrocity crime prevention. The three-day activity gave ICGLR and state representatives a space to share best practices and learn about the latest trends in prevention. Germany’s Federal Foreign Office, the Stanley Foundation and the ICGLR Secretariat co-organized this interactive activity—AIPR’s first of 2015. The meeting on Wednesday, January 7, was devoted to an overview of the progress of the various ICGLR national committees, the status of implementation of recommendations of previous meetings and discussions, and the presentation of an Action Plan for 2015. The day also included presentations on the political and security situation within ICGLR Member States as they relate to human rights and a discussion about best practices drawn from ICGLR States with established national committees (Uganda, Tanzania, Congo, Rwanda, Zambia and Kenya). An interactive training for regional and national committee representatives took place over the next two days on January 8th and 9th. The goals were two-fold: 1) to empower participants with the knowledge and skills necessary to create and sustain regional and national committees related to prevention; and 2) to strengthen capacity-building by reinforcing a regional ICGLR network of genocide-sensitive policymakers to serve as agents of genocide and atrocity crimes prevention in their respective countries. Modules included “Media as Partners in Genocide and Atrocity Crimes Prevention,” delivered by Dismas Nkunda, Executive Director, Atrocities Watch Africa, and “Women as Partners in Genocide and Atrocity Crimes Prevention,” with Lina Zedriga Waru Abuku, a member of Uganda’s national committee and a 2014 Global Lemkin Seminar alumni. Other participating Lemkin alumni included, among others, Tanzania national committee’s Felistas Mushi, who led a module devoted to the development of the committee and the valuable lessons learned in the process.